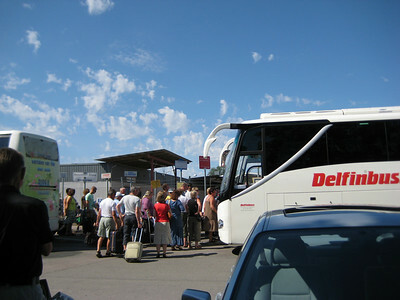 The cruise line runs a bus service from Uppsala directly to their dock on Södermalm in Stockholm, so our journey began a little incongruously by catching a bus in the parking lot of the Willys grocery store on Uppsala's west side. As luck had it, the city bus I take to work every day runs right to this pick-up point; after a somewhat sweaty commute, the Viking bus was quite comfortable (and air conditioned!). An hour later we were at the docks, and I at least gawped like a yokel at the size of our ship, the Mariella (which was in turn quite a bit smaller than many other ships we would see on the voyage). Humiliation and plundering of the guests began immediately, as there was a fellow with a camera taking pictures of everyone as they enter the glass-enclosed gangway and pass under a cheesy "Welcome Aboard" sign (if you can find yours pinned to the public bulletin board, you can have it taken down for only 5€/50 SEK!). At least the clowns with balloons at the door of the ship itself left us alone. We found our cabin (a B2P on level 4, in case you're still looking at the schematic) to drop off our stuff, then ran back out to grab seats for departure. Many people come on these cruises for the sole purpose of purchasing alcohol, for immediate (and future) consumption—more on that later!— for now, suffice it to say that the open-air bar on level 8 was already hoppin' by the time we got there, and we ended up stowing ourselves on a south-facing locker for the first hour or so of the voyage. The journey from Stockholm goes thorough the extensive system of islands that make up the Stockholm archipelago, and once the city ends, the coast seems to be one nice house after another either on the water, or perched on a cliff just above the water. McMansions were few; most houses were smaller and obviously older, although many had been refit with larger windows. Most have a dock, and many had at least a boathouse as well. There were plenty of people out sunning themselves on beaches (and waving at the big boats), and plenty of pleasure craft out and about as well (often also full of people waving at the big boats). Space cleared out after a while, as fellow passengers headed in for dinner, and we moved up to deck 11, the top deck, which gave us a panoramic view. The cooler temperature was very pleasant after the heat of the day, but the coolness (and hunger) eventually drove us back to our cabin to put on warmer clothes (and fetch the picnic dinner we had packed along). We stopped at level 6 on our way down, to check out the duty free store (massive, perfume-laden, full of alcohol and chocolate but including more exotic things like Finnish glassware and a freezer full of meat) and cafe (which we hoped to hit for breakfast the next morning). Although the duty free was full of tempting junk food (Pringles! Coke! ), the checkout lines were so long that we decided to save the foreign treats for later, and so headed back up to deck 11 for dinner. The islands did not peter out for several hours. Joe ran back to the store for dessert, Finnish chocolate (quite sweet) and a Danish beer (yuck!). 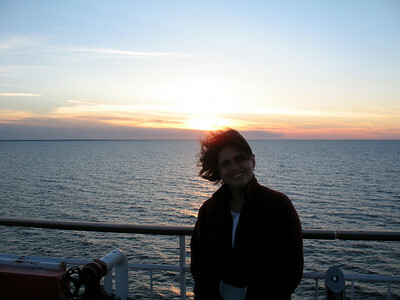 We stayed up on deck to watch the sunset, and then we got our first glimpse of Finland, as the southern and eastern islands of the Åland group hove into sight. We pulled into the small dock at the town of Mariehamn at about 20:30 Stockholm time, dwarfing one of our sister ships (the Rosella), and then being dwarfed in turn by the enormous Symphony of the rival Silja line, which had been close on our heels ever since departure. We stayed up on deck for a while after that, looking at the few stars you could see in the south and east, and the slowly dimming remnants of the sunset. Eventually we remembered the time change (Helsinki is one hour ahead) and since we hoped to get an early start to see the Finnish coast as we approached Helsinki, we headed to bed around midnight, even though it was still light out. Our cabin was quite far astern, and, as it turned out, two levels directly above the aft propeller. Perhaps this was a slight improvement over our below-the-waterline cabin on Vesterålen, when we were directly above the forward steering propellers, but still, the almost but not quite regular humming of the engine was distracting at first. Good thing we had had plenty of fresh air and sunshine to help us get to sleep. 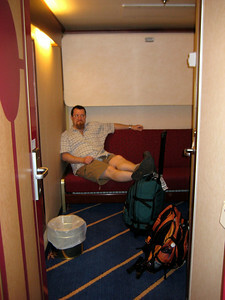 We were due to dock in Helsinki at 09:45, so we got up a couple hours before that to head up on deck. The day was already quite light (at these latitudes, an inside cabin without a window is a blessing not a shortcoming), and the Finnish coast quite close. I snagged some chairs on deck 11 again, while Joe went to the cafe (and stood in line for a while), but soon appeared bearing delicious pastries, a wrapped sandwich, yogurt, and fruit for breakfast. 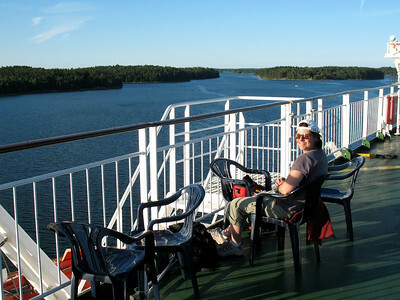 The southern coast of Finland appears to be well populated, but more with industry than with houses. 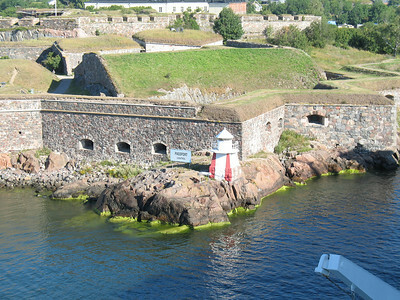 As we came into port, the ship slowed to the thread the narrow channel between islands and we got fantastic view of the 18th century Swedish fortress on Suomenlinna. (When we come back, we plan to do what everyone else does and take a picnic lunch out to the walls.) 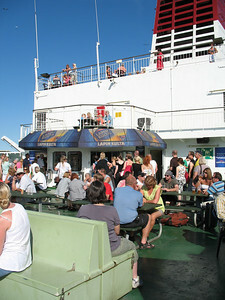 The harbor was bustling with many smaller local ferries, including one called SuperSeaCat, with its memorably fierce artwork. A couple minutes of careful maneuvering, and there we were. Welcome to Helsinki!